This morning's Sunrise Serenade was "On The Sunny Side Of The Street" by the Benny Goodman Sextet with Peggy Lee on vocals. Click on the song title to listen courtesy of Jazz On Line. Today's Sunrise Serenade was "It's Been A Long, Long Time" by Harry James and His Orchestra with Kitty Kallen on vocal. Click on the song title to listen courtesy of Jazz On Line. The playlist for the September 27, 2017 broadcast of the Swing Shift Shuffle has now been added to the playlist filing cabinet. This morning's Sunrise Serenade was "Memphis Blues" by Fletcher Henderson. Click on the song title to listen courtesy of Jazz On Line. Today's Sunrise Serenade was "Just A Gigalo (I Ain't Got Nobody)" by Louis Prima and His Orchestra. Click on the song title to listen courtesy of Jazz On Line. I found this post on Vintage Ads interesting because it is an ad for oil during wartime, when it was heavily rationed. To the extent the manufacturers could still sell to the public, they still needed advertising. While the title suggests that Betty Boop has earned her medical degree in this short, her doctorate appears to be from the school of snake oil. Betty and company set up their wagon to sell "Jippo," a wondrous cure for all ailments. Some typically odd early 1930's gags and hot jazz ensue, with a interesting Dr. Jekyll and Mr. Hyde ending. From the Internet Archive, here is the 1932 animated short, Betty Boop, M.D. This morning's Sunrise Serenade was "I've Been Waiting For Your Phone Call" by Bonnie Baker. Enjoy the video from YouTube. 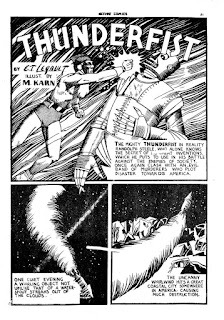 According to Pappy's Golden Age Comics Blogzine, prior to World War II, Canadians were able to enjoy U.S. comic books. With the advent of war, however, comic books were not high on the list of import priorities for the Canadian government, so our friends up north made their own. Due to tighter budgets, these comics were in black and white. This comic, Thunderfist, tells the story of a superhero whose powers are apparently thanks to his own inventions, and who defeats the deadly mechanical devices of a foreign power. Today's Sunrise Serenade was "The Mood That I'm In" by Valaida Snow. Click on the song title to listen courtesy of Jazz On Line. The playlist for the September 20, 2017 broadcast of the Swing Shift Shuffle has now been added to the playlist filing cabinet. This morning's Sunrise Serenade was "American Patrol" by Shep Fields. Enjoy the video from YouTube. 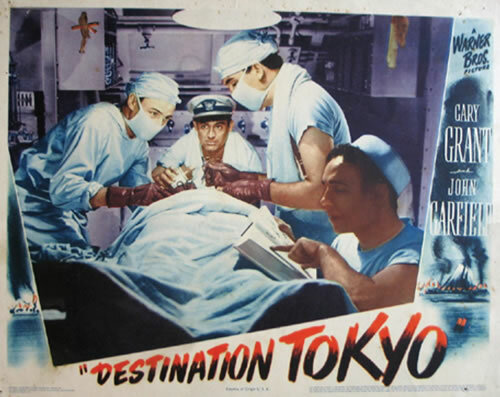 Destination Tokyo is one of my favorite double wartime movies, being both about and released during WWII. One of the subplots involves a seaman diagnosed by the pharmacists mate with acute appendicitis, and who will certainly die without surgery. The captain (Cary Grant) convinces the pharmacists mate (William Prince) he can perform the surgery. The tension builds as the operation takes place, but the surgery is a success, and the seaman recovers. The entire film is a morale building vehicle for the folks at home, and this story was part of it. This story, however, was based on fact. As I learned from This Day in World War II History, on September 11, 1942, a pharmacists mate on board the U.S. submarine Seadragon performed an emergency appendectomy on a fellow crewmember in circumstances essentially like those depicted in the film. More details at the U.S. Naval Institute Naval History Blog. Today's Sunrise Serenade was "Lovable" by Bing Crosby. Enjoy the video from YouTube. 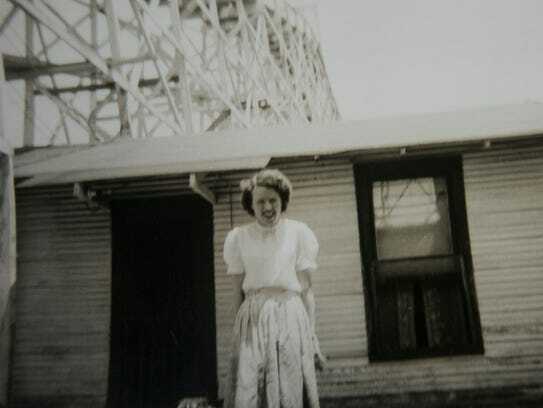 The Commercial Appeal recently ran an interesting story about Bob and Laura Coleman, who in 1948 or thereabouts, moved into a little house that sat beneath the wooden structure of the Pippin, the Shelby County Fairgrounds roller coaster that later became famous as Elvis Presley's favorite ride. Until it was "disassembled" in 2010 and shipped to Green Bay, Wisconsin, it was the oldest surviving roller coaster in the U.S. Mr. Coleman maintained the Fairgrounds rides until 1960, including the Pippin. Dinner conversation at home may have been difficult during operating hours. Today's Sunrise Serenade was "Thanks For The Boogie Ride" by the Gene Krupa Orchestra with Anita O'Day on vocals. Click on the song title to listen courtesy of Jazz On Line. The playlist for the September 13, 2017 broadcast of the Swing Shift Shuffle has now been added to the playlist filing cabinet. Today's Sunrise Serenade was "I Double Dare You" by Larry Clinton and His Orchestra. Click on the song title to listen courtesy of Jazz On Line. This morning's Sunrise Serenade was "Star Dust" by Louis Armstrong. Click on the song title to listen courtesy of Jazz On Line. Here is a classic Bugs Bunny Cartoon. Elmer is advised he will inherit $3 million from his Uncle Louie, as long as he does not harm any animals, especially rabbits. This information curtails his rabbit hunting, and gives Bugs all the opportunity he needs. Posted on YouTube, enjoy this 1942 Warner Bros. short, The Wabbit Who Came To Supper. This morning's Sunrise Serenade was "Savoy" by Lucky Millinder and His Orchestra. Enjoy the video from YouTube. Today's Sunrise Serenade was "Sweet And Lovely" by Tommy Dorsey and His Orchestra. Click on the song title to listen courtesy of Jazz On Line. The playlist for the September 6, 2017 broadcast of the Swing Shift Shuffle has now been added to the playlist filing cabinet. This morning's Sunrise Serenade was "Tico-Tico No Fuba" by Carmen Miranda. Click on the song title to listen courtesy of Jazz On Line. It can be a small world, both in terms of space and time. For example, as Vance Lauderdale of "Ask Vance" recently posted, sitting in Sydney, Australia is a 1931 Cadillac V-12 Sport Phaeton that was first sold by Southern Motors Cadillac here in Memphis. Vance tells the interesting story of the dealership and the car's trip from Downtown Memphis to Down Under. Today's Sunrise Serenade was "Out Of Nowhere" by Ella Fitzgerald and Her Orchestra. Click on the song title to listen courtesy of Jazz On Line. It being Labor Day weekend, I thought this Walt Disney tribute to the working man would be appropriate. Donald Duck decides to take a job as a riveter on a construction site, and the expected high-impact antics ensue. From YouTube, here is the 1940 short, The Riveter.